Click to see a map of this area. Can you find the locations of the photographs on the map? Use the aerial photograph option on the map page. 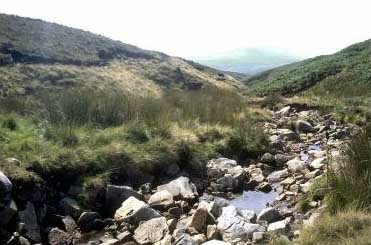 Jam Sike (see Part 1) is the longest of the small streams draining Newby Head Moss and Gayle Moor. 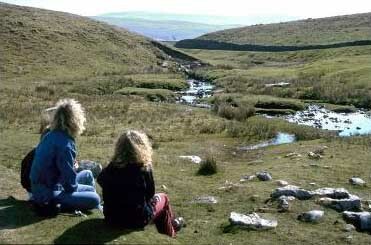 These streams all join Long Gill. The boulders in the picture have been carried along by the force of moving water. They have been dropped here when the force of the moving water was not great enough to carry them further. The stream has eroded an even deeper path for itself here than nearer the source. The hill seen faintly in the distance is Whernside. A little further downstream, the scenery changes - there is no heather and there are no rushes. Instead a mixture of fine grasses grow. There are also outcrops of the underlying limestone. Limestone has natural cracks, through which surface water can drain. These are made larger, as water actually dissolves away the rock. Small streams form in horizontal cracks under the surface. The depressions shown in this photograph are called shakeholes . They are places where the ground above these shallow, underground streams has caved in. 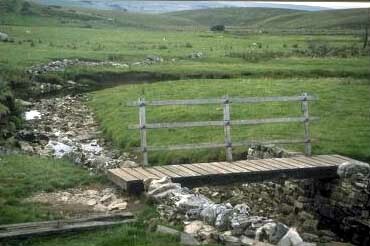 Long Gill runs very close to the B6255, and from where it passes Gayle Beck Lodge, it becomes known as Gayle Beck. This photograph (taken about 6km downstream from the source of Jam Sike) shows a footbridge carrying a path, from the road near Ribble Head House, to join the Ribble Way. 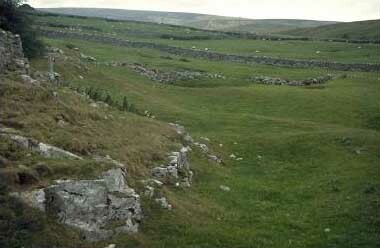 It is the area around the junction of these roads which is popularly known as Ribblehead . In summer many visitors park on the road verges in this area. This photograph is taken looking south east, with Pen-y-ghent in the distance. The famous railway viaduct (see Part 9) is in the opposite direction.